My background was very modest, little thought was given to music, art, or culture. Survival sucked up most of my parents energy and attention. With my parents so very distracted, I withdrew into my own world, my greatest solace, the source of so much that I love to this day, was an enchanting set of books called “My Book House”. They were arranged from kindergarten to twelfth grade. I inhaled every volume, Shakespeare, Wagner, Greek mythology, Aesop’s fables, tales of chivalry, enchanting world after enchanting world. My particular set was published in 1937 and edited by Olive Beaupre Miller. I was particularly taken with the numerous images accompanying every tale, poem, or light history. Many of the illustrations were by a fellow named Donn P. Crane. 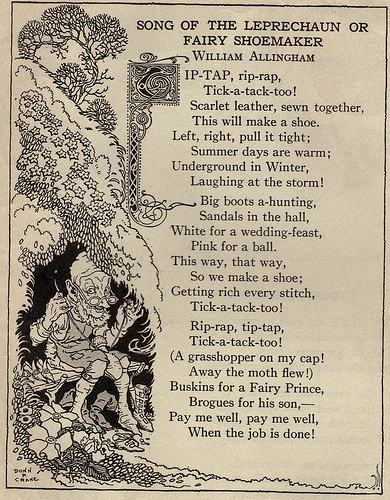 This particular image was produced in 1920, I haven’t researched the twelve volumes in a while, so I am unsure as to which tale he is illustrating. As you can see his composition is flawless, simple lines evoke so much depth and charm. I was delighted as a boy, and I find myself still delighted. Many of the illustrations were black and white, his line work compensated for the lack of coloring. Many of the illustrations were of a very limited palette , orange and turquoise. As a boy I did not like this palette, it felt limiting, cold, and alienating. If it hadn’t been for Mr.Crane’s magic, I wouldn’t have been able to endure the Howard Johnson’s color-way. I now of course love the combination, the use of opposites is powerful, it allows nuance and subtlety, and I imagine satisfied either budget or printing restrictions. 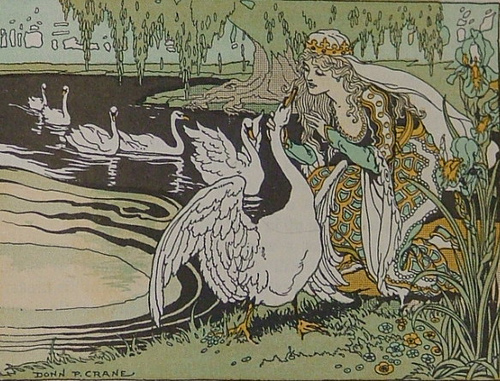 What I have always wondered about was if there was a connection to Walter Crane and Donn P. Crane. I see stylistic similarities, I have long fantasized that Donn was a son. I have lazily researched this topic and come up short. If anyone has a clue to Mr. Donn P. Crane’s history I would be delighted to know. Mr. Crane shaped my childhood, my taste was cultivated by his work and I still find myself inspired by the fantasy he created. The set of “My Book House” that I grew up with is most like the bottom selection, a handsome dark navy. My mother, who was the first owner of the set remembers a fanciful bookshelf shaped like a little house. So very charming, but lost to time. Another remnant of my mother’s childhood that enhanced my own rather bleak one, was a set of Victorian bookends, heavy ,ponderous and pretentious,shaped like a Regency bookshelf,they charmingly quote Shakespeare with “My library was Dukedom large enough”; with Crane and “My Book House” it certainly was. This entry was posted on July 17, 2010 at 9:47 pm and is filed under 20th century, Donn P. Crane, My Book House, Walter Crane. You can follow any responses to this entry through the RSS 2.0 feed. You can leave a response, or trackback from your own site. what a wonder they are. I know what you mean about the limited palette…it satisfies as an adult because we understand the necessity of brevity without baroque, but as a child one feels cheated of the array of nature’s splendour…it’s so thrilling to be able to read your thoughts and feel close to this part of you again. perfectly put, I did, as a boy, feel cheated by the limited colorway, you tapped into my unspoken feelings perfectly. Please follow and add input, will be like old days, tea, biscuits, and dreary P’burgh days, looking at paintings, i miss those days. p.s. check out The Textile Blog, link on my blogroll, you will love it. It is amazing how images from childhood go on to shape and inform our adult lives. I also have childhood books that I still cherish. hold on to them ! Donn P. Crane is my grandfather. Alas, no relation to Walter Crane. He was born in 1878 in Springfield, MO and died in 1944 in Chicago, IL. A self-taught artist, he was able to support his family as an illustrator, primarily of children’s books. I, too, am amazed by his illustrations. However, I recently discovered several of his sketchbooks from 1908. He spent a couple years in New Mexico drawing and painting. His pencil drawings are mind-blowing! I wish I had had an opportunity to know him. Alas he died before I was born. Ann has graciously given me a charming image of her grandfather, with new work. I am eager to post in November. Please check them out. SO happy to know of another who has loved Donn, he is a huge inspiration to me; did you own My Book House? If not what was your source for Crane-magic? Hello Ann–from your reply about your grandfather Donn Crane, I think the information and dates sync and confirm that your grandfather knew Ray and Zola Whitney. I have photos of your grandfather and grandmother taken on one of their visits to the Whitney summer home in Eagle River, Wisconsin. As a young boy, my late husband, Brad Kauzlaric, received a signed copy of one your grandfather’s books. He remembered meeting him and, I think, was inspired by his work as he became an artist as well. In his later years, Brad also wrote and illustrated children’s stories but these efforts were not the main focus of his life’s work. In writing a bio for an upcoming book about Brad, I remembered Donn Crane, and wanted to know more about him–thus a little “research” online and the discovery of the Babylon Baroque blog. Thank you Leonard. Happy you found Ann, take care and good luck with the bio, what was Brad’s life work, if I may ask. DeAnna, this is really interesting! And yes, thank you Leonard! I cannot tell you how thrilled I am to “meet” you. Your grandfather frankly saved my life, placing me on a better path. My childhood was pretty squalid, his illustrations meant so much to me. They offered solace and civilization.I recently attended a production of Wagner’s Ring cycle. It was your grandfather who first introduced me to that music , not Rackham. He really touched me, if I could thank him I would, please accept my gratitude. Hi, I am interested in this subject because another illustrator, contemporary with Donn P Crane, is Herbert Rudeen. I have searched and researched Herbert Rudeen for similar reasons you have given in your search for Donn Crane. The two often illustrated the same children’s book. Herbert also illustrated some of the early editions of My Bookhouse, but not the later. Donn Crane is more widely known. Herbert Rudeen is my grandmother’s brother, so he is my great uncle. I met him a few times. He died about 1985 and lived in Pensacola. He illustrated hand made Christmas cards for the family and I have a few originals. I also have a couple of his original paintings. Not much can be found on this subject but occasionally you will find some of the books both men illustrated. I usually find them on ebay. I have quite a few of these books. I don’t have My Bookhouse from the 1920s yet. They are very costly! I hope to hear from you! I confess I am not familiar with your great uncle Herbert Rudeen’s work. I will be eager to look into it. My collection of My Book Houseis the ’37 edition, it was my mother’s childhood collection.I look forward to buying other editions, but yes they are costly. My collection is rich in Crane’s work, a quick glance at a few of the volumes did not have Rudeen’s illustration work. I will be doing another post on Crane, I have received some new images from his grand-daughter from the family’s collection, I am eager to begin that post. Winter break is coming up, I will be better able to focus. Please keep in touch, I will try to find more info. I came across this site this morning while searching for Herbert Rudeen. The story book series with which I grew up was the 1937 edition of Childcraft. I returned to the Folk and Fairy Tale section today for a teaching project, and as I am very fond of early 20th century illustrators, I wanted to know more about the illustrator of “The Stonecutter.” This series includes many illustrations by Donn P Crane. I have only the first two volumes, extremely well worn. The Childcraft Books probably saved my mother’s sanity, for they kept my brothers and me occupied for days on end. Hi I really like these, are there an original drawings by Donn Crane for sale anywhere? That I do not know, will forward that request to the family. He is a wonderful artist. I am so excited to read this thread! 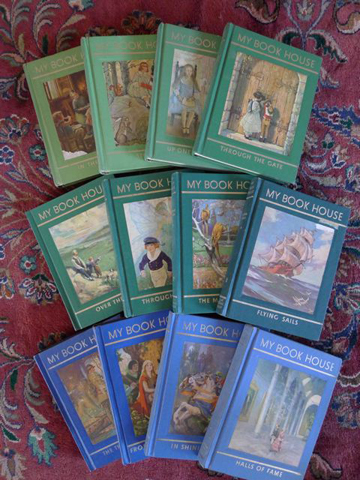 I adored the “My Book House” books as a child. My memories of the books are always of the amazing illustrations, not the stories. I have grown up to be an illustrator myself. Recently, I was antique shopping in Port Townsend WA, and discovered the books on the shelf. My heart grew ten sizes and I snatched them up and took them home. One thing that really stands out to me about the drawings now is how much they have obviously influenced me as an artist. I spend hours upon hours poring over those drawings, they must have really sunk in. I can totally relate, I fortunately inherited (stole) my childhood set . As an artist I always find the influence of the Book House series , most particularly Crane’s work, an inspiration. The narrative quality is a constant theme to play off of. Thank you for posting , it is always a pleasure to hear from reader. I have a book from my childhood entitled “The Child’s Treasury” published by The Foundation Library. According to the Library of Congress catalog of copyright entries, it was edited by May Hill and published on 29 Sep 1923. My mother, as a young teacher, acquired it in 1927. I loved that book, and it contributed to my lifelong passion for reading. Recently I looked at it again and was once again transported by the enchanting illustrations. Most were by Donn P. Crane, but some were also by Billie Parks, Herbert Rudeen, and E. R. Kirkbride. Although I cannot copy the whole book (it is 400 pages long), I can copy come pages with illustrations for anyone who is interested. I haven’t heard of “The child’s Treasury”, seems a treasure indeed. Would of course love to see images, always eager for Donn’s work. My posting about Donn has introduced me to many wonderful folks, I include you in that circle. Thank you for taking the time to post . I am happy to find this. I also grew up reading MyBookhouse. I have kept the set I got from my father these 70 years. I wore out vol 3 but was lucky enough to find a copy a few years ago so can read it again. That’s fantastic, always happy to meet another Book House fan, there aren’t that many I am afraid. I posted a Donn P.Crane bookplate on my blog in December. At the time I did not have the artist’s full name so Google searches were not very helpful. Last night Ann sent me an email with more specific information and a link to your blog posting. May I include a link to your blog when I update my blog ? I have lately come upon this site and having admired the artwork of you grandfather, Don P. Crane in Olive Beaupre Miller’s wonderful volumes; My Book of History, I was wondering if there have been any plans to publish a biography of Don Crane with illustrations of his works. I read where you sent an image of Don Crane to Leonard, but cannot seem to access I first discovered My Book of History in the school library, and I was won over by his illustrations. Miller’s text was so much better than the text book we used on the same subject, and the illustrations were an extra treat. Thank you for sharing. Do you know of any plans to publish a biography of Donn P. Crane and his artworks? Such would be welcomed by many admirers who appreciated his works in the various series printed by the Bookhouse for Children. Really appreciate this site. No I do not know of any upcoming biography or volume devoted to his considerable talent. It is a pity. One day I would like, with the families permission to put together at least a published paper. Unfortunately my own studio work occupies a considerable amount of my time. When i receive new images i always post them for his fans. I must agree with you concerning his work and My Book House, my education concerning history and culture really was established by my exposure to the volumes and the artists, particularly Crane. I too have a collection of the History volumes,they are a delight, wonderful for rainy days. Thank you for your comments and interest. Thanks for nice comments. My sister has wanted to put together a retrospective of his work, but who knows when that might happen…. I’ll mention your comment to her. In all honesty, since I never met my grandfather, I have had to be the sleuth in gathering info about him. If and when, please know you can count on me for assistance. I would love to lend a hand in remembering a man who was so very influential to me. In fact, i am working on a new series (found @ http://www.boondocksbabylon.wordpress.com)and so much of the work is in “Book House” turquoise and orange. Not sure if Donn liked the limitation of the palette or found it restrictive. It is a question I would like to have asked him. Thanks so much Leonard. I imagine my Dad would have had a wealth of information to provide if I had thought to ask him (such as your palette query). I look forward to checking out your new series! Dear Ann Crane, thank you for your response. 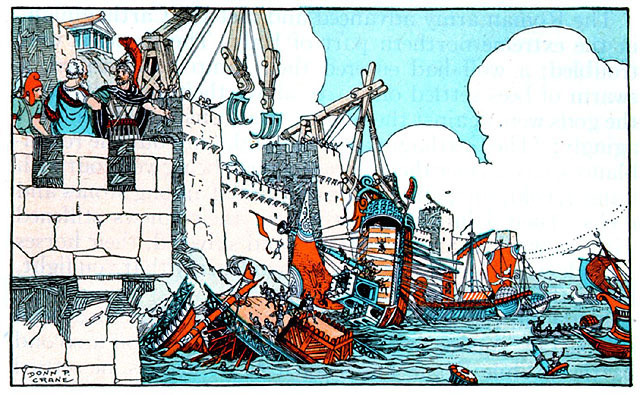 I first discovered the My Book of History: a picturesque … when I was in grade school, in the school library. The series by Olive Beaupre Miller was so much more informative than the class text book on western civilization and the illustrations won me over. I wonder if in the Donn P. Crane Sr. papers there was information on how he was selected by Ms. Miller to illustrate the two series; My Bookhouse and My Book of History prior to 1929. As early as the 1935 edition of the history series,and In latter editions both the text and illustrations were edited with the results being less than the 1929 original. It wasn’t until I was in my 30s that I re-discovered these series and bought them as gifts to give to friends raising a family . One wonders if Donn P. Crane Sr. realized what an impression his art would make on future generations? Lucky great grand child!, Lucky you!